Kinetic Theory, Volume 2: Irreversible Processes compiles the fundamental papers on the kinetic theory of gases. This book comprises the two papers by Maxwell and Boltzmann in which the basic equations for transport processes in gases are formulated, as well as the first derivation of Boltzmann's “H-theorem” and problem of irreversibility. Other topics include the dynamical theory of gases; kinetic theory of the dissipation of energy; three-body problem and the equations of dynamics; theorem of dynamics and the mechanical theory of heat; and mechanical explanation of irreversible processes. This volume is beneficial to physics students in the advanced undergraduate or postgraduate level. 10. 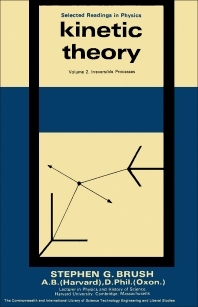 On Zermelo's Paper "On the Mechanical Explanation of Irreversible Processes"